Grapeseed oil is the perfect choice for hair care as it contains vitamin E, which is essential for hair growth, along with extensive proteins, minerals, and linoleic acid to benefit hair. Hot oil treatment with grapeseed will help hair look shiny and moisturize the scalp to prevent dandruff. The oil once absorbed into the hair, strengthens each strand from the roots, preventing thinning, breaking, split ends. It smooths the cuticles, preventing frizz. Used on its own, Grapeseed Oil can also blend with other essential oils like lavender or rosemary for a hot oil massage treatment. 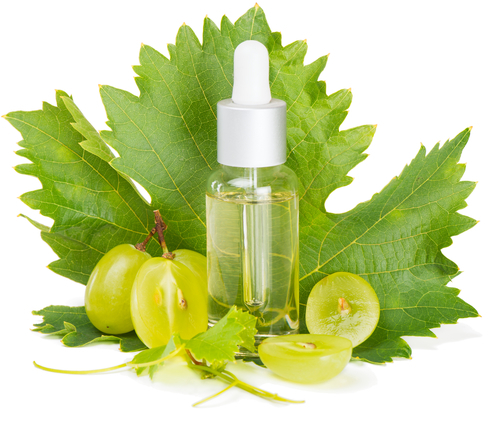 Regular use of Grapeseed Oil in hair care products will leave the hair stronger and healthier. It works as a moisturizer and conditioner for dry hair and does not leave any scent as it is odourless. Rubbing of the oil on your scalp will prevent a dry and flaky scalp and promote blood flow. Oil extracted from grape seeds that are cold-pressed contains antioxidants that block the promotion of DHT which is a hormone that causes hair loss. It promotes relaxation of hair follicles, preventing hair loss caused by cortisol, a hormone released when you’re stressed. Mix a few teaspoons of grapeseed oil with a drop or two of jojoba oil and rub into your scalp to treat hair loss.